What Is DD Form 2660? DD Form 2660, Statement of Claimant Requesting Replacement Check is a form used by intended recipients of U.S. Treasury checks to request a substitution in cases when the checks are lost, stolen, destroyed or canceled due to limited payability. 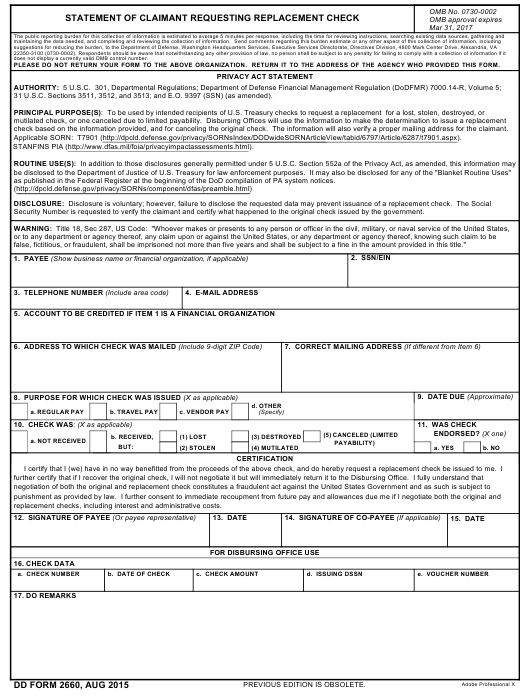 The current DD Form 2660 fillable version is available for digital filing and download below or can be found through the Executive Services Directorate website. The information provided on the form will be used by Disbursing Offices to make the final decision on a case or cancel the original check and may be disclosed to the Department of Justice for law enforcement purposes (under 5 U.S.C. Section 552a of the Privacy Act). The DD 2660 - sometimes incorrectly referred to as the DA Form 2660 - was released by the Department of Defense (DoD) in August 2015 with all previous editions obsolete. How To Fill Out Dd Form 2660? PLEASE DO NOT RETURN YOUR FORM TO THE ABOVE ORGANIZATION. RETURN IT TO THE ADDRESS OF THE AGENCY WHO PROVIDED THIS FORM. 31 U.S.C. Sections 3511, 3512, and 3513; and E.O. 9397 (SSN) (as amended). check based on the information provided, and for canceling the original check. The information will also verify a proper mailing address for the claimant. be disclosed to the Department of Justice of U.S. Treasury for law enforcement purposes. It may also be disclosed for any of the "Blanket Routine Uses"
as published in the Federal Register at the beginning of the DoD compilation of PA system notices. Security Number is requested to verify the claimant and certify what happened to the original check issued by the government. false, fictitious, or fraudulent, shall be imprisoned not more than five years and shall be subject to a fine in the amount provided in this title." replacement checks, including interest and administrative costs. Payee name, business name or financial organization. Payee’s SSN ( for individual) or EIN (for business). Enter account number to have been credited. Date check was due to arrive. Signature of the Payee or payee representative. Signature of Co-Payee (if applicable). Box 1 requires the full name of the payee or the business name of the financial organization. Box 3 requires the payee's phone number. Box 4 is for the payee's e-mail address. Box 6 requires the address the original check was mailed to. A correct address is specified in Box 7 if different from the one provided in Box 6. The information in Box 8 should describe the original purpose of the check. The approximate date of check arrival should be in Box 9. Box 10 is for providing a reason for the check to be replaced. Box 11 should indicate whether the check was endorsed. The payee has to provide their signature and date of filing and sign the form in Boxes 12 and 13. A co-payee - if there was one - needs to provide their signature and mark the date of signing in Boxes 14 and 15. Boxes 16 and 17 are for the Disbursing Office use only.